Preheat oven to 180°C/350°F. Finely dice shallot and cut green onion crosswise into thin rings. In a small bowl, mix together cheese, paprika powder, chili flakes, vegetable oil, and green onion. Season to taste with salt and pepper. In a large frying pan, heat up some vegetable oil over medium heat and sauté shallot for approx. 1 – 2 min. Then, add spinach and continue to cook for approx. 1 – 2 min. until wilted. Grate nutmeg into pan and stir thoroughly. Remove from heat. Gently remove the mushroom stems from the caps. Then, gently scrape out the core of the caps with a spoon to create a cavity for filling of choice. 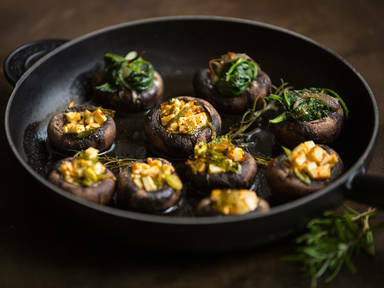 Fill mushroom caps with either the spinach or cheese mixture and place in an ovenproof frying pan or on a lined baking sheet. Transfer to a preheated oven and bake at 180°C/350°F for approx. 12 – 15 min. or until cheese melts and turns golden brown. Enjoy!